There are many fundraising opportunities open to the general public that will benefit education and our local schools. It's simple to participate if you understand the programs. A new phenomenon occurred the year my grandson entered preschool. It began in his home, spread to mine, and could eventually be seen in the household of every immediate family member. I can provide an easy description...It is not uncommon to look in my cupboards, pull out a box and initially think that mice have pulverized the upper right hand corner and gained access to the contents. Thankfully, I know this is not the case. I simply have a couple of family members that are Box Top fanatics! Many readers may remember Betty Crocker box top coupons. The coupons had a point value and were redeemable for discounts on products featured in the Betty Crocker catalogue. The catalogue products were primarily household items. This began in 1929 and it wasn’t until 2006 that the coupons and the catalog were discontinued. In 1996, General Mills launched Box Tops for Education. Schools throughout the United States participate in collecting the coupon icons that are located on the packaging of many General Mills Products. Eventually the program expanded to include many other food brands and some brands of nonfood items. Currently there are over 250 products that carry the Box Top coupon icon. A single Box Top has a value of 10 cents but quite often the value is doubled with multiple icons on the box or on the label. An example of this is a canister of Betty Crocker frosting. All schools in the United States that provide instruction to any grade 8 and under are eligible to participate, both Public and Private. United States Military Schools worldwide and home school associations with a membership of 15 or more students are also welcomed and encouraged to participate. At the present time there are over 90,000 schools involved in this fundraising program. 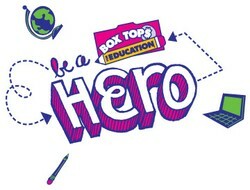 Locally, I know that grades 9-12 collect Box Tops for Education and turn them over to the Elementary schools for use. This makes perfect sense. The more monies the primary grades earn, the less they require from the overall school budget for extras. The saved revenue can then, ideally, be used toward the needs of the older students in the district. There are various ways to earn under the Box Tops for Education program. Clipping the Box Tops from packages is the most popular but your school will also earn credit every time you shop online through the Box Tops Marketplace. I noticed many of the retailers also offered a substantial discount. For instance, Lands End offered 30% off your purchase and a 4 ebox top credit for your school for every ten dollars spent. A sampling of some of the other retailers I noticed included Cabela’s, Dollar General, Ramada, and Highlights for Children. Other opportunities available for raising funds for your school fell under the subcategories Clink & Earn, Bonus and Local Retailers. The Box Tops for Education website, www.boxtops4education.com/ is easy to navigate around. If you have never visited this site I would recommend taking a few minutes to check it out. In addition to offering a wealth of information, there are interactive games and sweepstake opportunities on the site. You can also track the progress of your local schools and read numerous success stories. An outstanding feature of this program is that no one is precluded from contributing. You don’t have to have a student at home. With a little effort you can help any school by forwarding your physical Box Tops to the school’s coordinator. If contributing online is more your style, you can designate the school of your choice and it will receive the eBox Top credits you accumulate. My bottom line on all of this is quite simple. I often have cheerios spewing out of the box when I reach for it. Sometimes I don’t know what flavor frosting I am selecting for a cake until it is actually opened and I’ve been known to find my scissors in the freezer with boxes of toaster strudels that have been clipped before their time. The reason I encounter these things is because someone thinks I won’t remember to do my share before dropping the packaging in the garbage. I refrain from complaining and when I think about it I have to smile: my daughter and grandson’s habitual act of meticulously inspecting the contents of my cupboards prior to Sunday dinner. I’ve read the statistics, I understand their motivation and now I acknowledge the value. My grandson’s school received a check in December of 2012 for $ 3,599.10 and the earnings for the period of 2012-2013 total $4,464.30 so far. That equates to books, computer programs, art supplies, games and quite a few extras that my grandson and other students will benefit from. Since 1996, Box Tops for Education has paid out a total of 400 million dollars. That reality is nothing to make light of. In a tough economy every little bit helps and sometimes the little things make a substantial difference in the long run. Do you participate in the Box Tops for Education Program? If not, Are you motivated to do so now?